Need to get it in, especially when being on the road in places less traveled. Aight, protein is one of the pillars of your humanly vessel, being an integral component of literally every cell you are made of with extensions like hair and nails being almost completely made of it. No matter if you are a gym junky bulking up or laying low when it comes to physical exercise, protein is needed for its ability to repair tissue and to build bones, muscles, cartilage, skin, and blood. The problem is that one’s body does not store protein, which means that you need to constantly replenish to remain a functioning unit and to prevent muscle loss, maintain a healthy weight while curbing hunger and ensure speedy recovery. Some ways to ensure that your protein levels are in the green region are more fun than others. Sure, you can scoop various flavours into that unsightly shaker of yours, but one of the more delicious and palatable ways I’ve found is ice-cream! 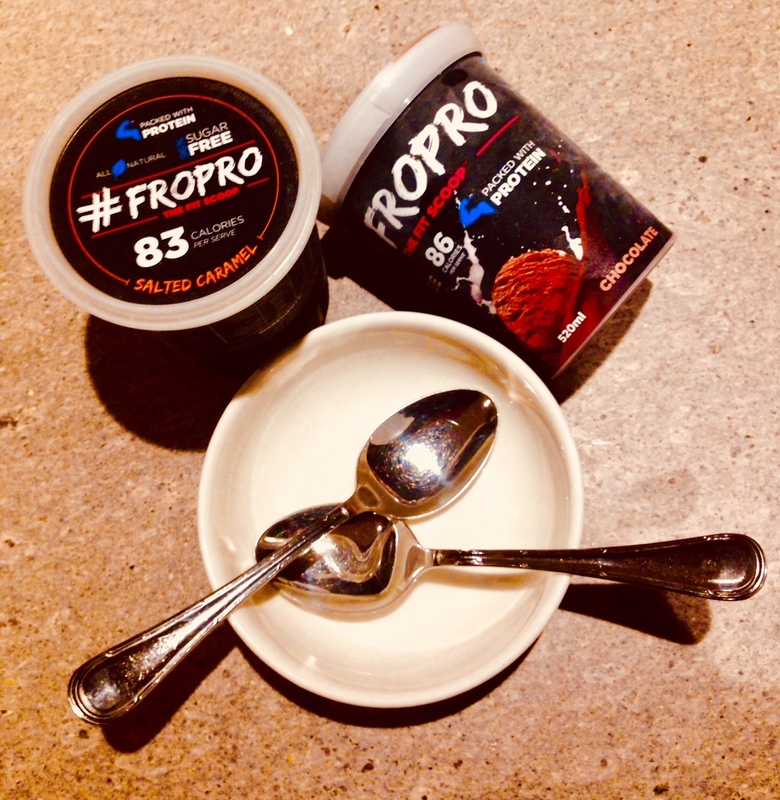 As the telling name FroPro suggests, this ice-cream is high in protein and natural ingredients and as an added bonus 99% sugar free, i.e. it has a fraction of calories that regular ice-cream contains. The Chocolate variants clocks in at 81 calories per serve while not damping the delicious dark chocolate taste and creamy consistency, which is enhanced by the use of whey protein isolate and a hint of coconut cream. The FroPro Green Tea & Mint derives its flavours from the adage of 100% pure peppermint oil. Made with the antioxidant Matcha Green Tea, it promotes fat metabolism and only has 71 calories per serve. It might be the best thing next to eating celery, where the act of eating it actually consumes more calories than what you are devouring. Now, my favourite flavour is by far the decadent tasting Peanut Butter Chocolate, which despite its rich name only has 87 calories per serve. It is made of whole Kingaroy nut butter mixed with chocolate. Sure, you can tell that it is not as rich as a tub of Ben & Jerry’s or as flamboyant as an emission from the local ice-cream designer powerhouse Messina, but it is surprisingly flavourful and makes the perfect treat either by itself or after dinner. I do like a bit of trekking and hiking, preferably in areas off the beaten track where you find yourself at times in the particularly challenging situation that chow is hard to come by, especially the variant with nutritional value for what Diamond Dave referred to as a “result oriented performance”, i.e. ones low on sugar and carbs and a bit easier on the jaw than beef jerky and a bit less perishable than fruit. Chief Bar tends to tick quite a few boxes in that regard: Despite being devoid of what is commonly considered to add flavor, e.g. enhancing yet hormone destroying chemicals, dairy, a truckload of sugar and gluten, cheap bulking agents. The aforementioned ingredients are being replaced with natural, whole food, nuts, minimally processed essential amino acids, nuts, dried fruit and grass-fed meat with some of the variants of their protein centric range. 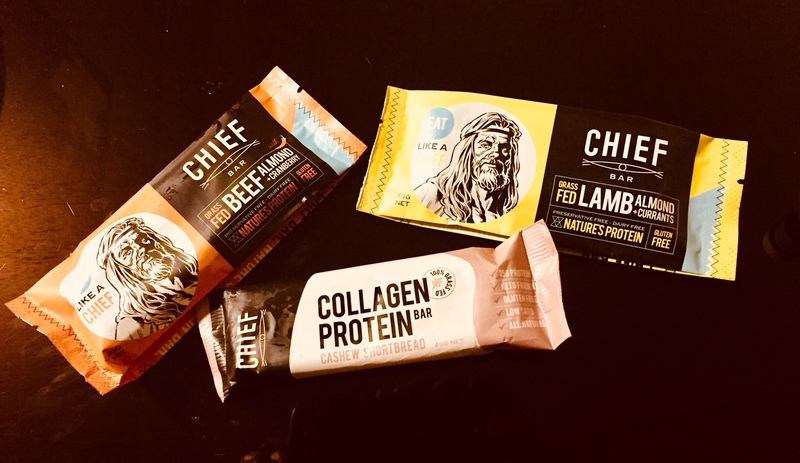 After doing a bit of homework on the brand, it was reassuring to see that the design of Chief Bar’s emissions is based on a sound nutritional basis and evidence-based science along with the Chiefs’ intrinsic interest in creating a product they would first and foremost like to consume themselves. It might not sound particularly enticing but some bars contain hydrolysed collagen, which aids in decreasing joint pain after exercise, helps with skin elasticity, makes cartilage more dense, and basically keeps tendons, muscles and bones together along with firming the tissue in skin – in layman’s terms: Collagen is the fundamental cornerstone of the protein family and you want it in your system especially as the protective lining of the gastrointestinal tract stars wearing thin. They comes as 100% Australian grass-fed and hormone free lamb, with the adage of almonds for their good fats to stabilize blood sugar levels and dried currants for the benefits of their phytonutrients, antioxidants, fibre and calcium. The 40g Beef bar is the big whopper of the family and the hint of chili add a bit of a kick to the game. I am currently en route to Tibet and got a stack of Chief Bars with me to get me through when the going gets tough. Read High Adventures in the Great Outdoors: Part 1 -- Weathering the Elements.